I was inspired to choose this as my 50 Book Club choice by Doc's review. After my review goes up, a few other 50-bookers will be putting up their reviews and we will have a discussion about it in the comments section below. [Here is the Mount Benson Report review. Here is the review at the University of Crumbolst. I am therefore going to review this book in two parts. The first part will be the standard kind of review I would have normally done for a book I read: a general overview, with no spoilers and a final recommendation. In the second part, I'll discuss specific issues that came up in the book and there will definitely be spoilers. This is the type of book where it is better to go in ignorant of what happens, so I strongly encourage you not to read the second part unless you are sure you aren't going to read the book. I'll say that The Light of Men is a really good book, but there are certain people for whom the genre doesn't really do much and I'll make that clear. The Light of Men takes place in a concentration camp in Germany in the last months of the Second World War. A new prisoner arrives who is healthier and more aware than the rest. He also seems to have a certain psychological remove from the horrors going on around him. He is on a mission to try and find a specific prisoner in the camp and goes about manipulating the internal politics of the camp to do so. The story is written with a limited omniscient perspective, so although Aaron is the protagonist, the author doesn't totally let you into his head, nor does he give you any more than subtle hints that he is somehow different. I'm going to stop all discussion here of any more of the narrative, because a lot of the enjoyment of this book is trying to figure out what is going on. I was concerned going in that a story of this type taking place in a concentration camp could have some very inappropriate results. The opening scene, where the trains first show up and the new arrivals are separated from their belongings and each other by older prisoners overseen by the SS, are brutal without being either exploitative or sentimental. It went a long way towards assuaging my concerns. Salmon has done his research and the opening scenes where the horrors of the camp are slowly laid out to the newcomer had the unpleasant but important effect of shocking my mind into realizing once again that this actually happened. As the book progresses, one becomes used to the constant horrors of the camp. The story takes precedence. I'm torn as to whether the narrative overshadows the horrors unrealistically (and perhaps too easily) or if that is a reflection of the human ability to adapt. It's been a while since I read Primo Levi's Survival in Auschwitz, but I remember that book had a similar effect at points of making the camps seem like really tough prisons rather than soul-destroying nightmares from which nobody wakes up. I guess that's the point. If you were lucky and tough enough to physically survive, it was those people whose minds could absorb the understanding of what humans really are who without snapping could come out the other side with any shred of life will left. 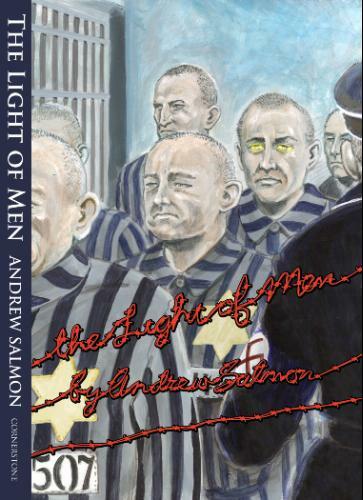 The Light of Men is an absorbing and entertaining read, a novel blend of history and science fiction, mixed with a light enough touch that the true horror of its subject, the holocaust, is emphasized. The story is gripping, a real page-turner. It did lose a bit of steam with me at the end, but ultimately redeemed itself. I'll discuss that more in the spoiler section below. The Light of Men is a small-press publication, available on Amazon but probably hard to find in a retail bookstore. I think the Light of Men would appeal to a wider audience than just science fiction readers, but it might be a little bit cold and removed for some non-geek readers out there. It definitely deserves wide, commercial distribution. A great read. I think the biggest difficulty I had with the book was the ending and the transformation of the main character. Partly because you spend so long not knowing who he really is that when he suddenly starts changing, you don't really have a base to change from. Furthermore, his internal logic didn't really make sense to me. I guess you could read it as a random result of an error, but it felt a bit like we needed and excuse to have a big action scene. Now, I quite enjoyed the action scene and the minor catharsis that went along with it, so I'm not complaining too much, but it just left me feeling a bit less absorbed into the story. He also never actually confirms whether Liebman is dead or not. As a reader, I felt something had been left out and it bothered me. One other criticism is that, though really quite magnificently horrific, the scene with the camp Kommandant and all the women veered into exploitation territory for me. It just went a little too far into the details that it felt like it was possibly trying to throw a little titillation (really not the right word because the scene was so horrific) into the mix. Ultimately, though, the way the book ended, where Aaron's involvement ultimately did nothing significant to change history, saved the book for me. I think the author succeeded in delivering a story without disrespecting the reality of the holocaust and its sufferers. It's a delicate balancing act, though! So I guess I don't have too much deeper to add than that, but I'll throw out some questions as I'm very curious to hear what other's positions and perspectives were on these things. Did anyone feel that it is simply inappropriate to have this kind of story take place in a concentration camp? Are there naive elements of revenge fantasy in The Light of Men that are disrespectful of the weight of the history of the holocaust? Was there a moral message in the book? When Aaron's logic couldn't handle his predicament and he flipped out, was that an argument to act against evil, whatever damage it may do? Did any of you learn anything from the portrayal of the camp? Ian MacAlister was on Lantzvillager's radar and I found it out in Winnipeg. 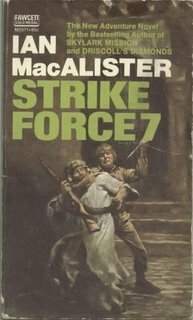 It's a commando adventure in the manner of Desmond Bagley, but tighter and grimmer. A tycoon's daughter and wife are kidnapped by tribal rebels in Morocco in order to pressure the government to release political prisoners. Knowing the government won't budge, the tycoon hires an ex-mercenary, who then assembles a team to try and infiltrate the mountain hideout of the rebels and rescue the wife and daughter. The story is told almost entirely from the perspective of the lead commando, Canadian Earl Jarrel, who just got out of a french prison for gun-running. Canadians in these books never seem very Canadian. Perhaps we were just way tougher in the '70s or perhaps a life of international warfare and crime will harden you up a bit. It just always seems that these authors like to throw in a Canadian guy without any real knowledge of their culture or character, so they come off as kind of a generic non-American english speaking person. I know we aren't the most identifiable of commonwealth peoples, but a bit more effort could be made on the writer's part. It's a minor quibble. The book is straightforward and enjoyable. The description of Morocco's crazy markets is captivating and the tracking through the desert and mountains gripping. There is little time wasted with sentiment or stupid behaviour and no unecessary morality to clutter up the proceedings. This is how these kind of books are supposed to be written. On the other hand, there wasn't anything remarkable or mind-blowing, so I recommend this book primarily if you are a fan of the genre. August West has a nice review here, with a bit more background on the author.